Magazine, 7″ x 10″. 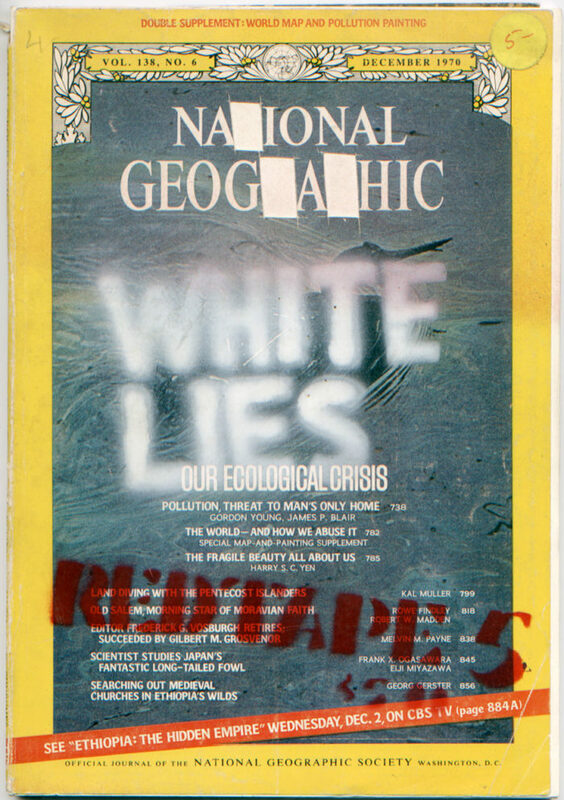 Covered in repurposed, hand-cut and stencilled National Geographic cover. Edited by Michael Carter and Michael Reilly. Cover concept by Julius Klein. Contributors include Richard Hambleton, Greer Lankton, Joseph Nechvatal, Paulette Nenner, Kambra Pfahler, Miguel Piñero, James Romberger, Walter Sipser, Seth Tobocman, Toyo, Marguerite Van Cook, Tom Warren, and David Wojnarowicz. White Lies. Fiction. The art of lying well. Simulate the truth, i.e., sound reasonable enough not to be instantly dismissed as lies because people have been told lies are bad and pretend not to like them. Exploit the haze between true and false in order to lie with beauty and conviction. Also: lies the white man tells. White lies—the kind that slide off as soon as said.